Making the right upgrades will prevent freezing pipes, keep rooms more comfortable and lower heating costs. 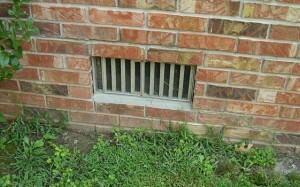 Closing crawl space vents won’t provide much protection against frozen pipes and cold floors during winter months. The simple answer to the question above is: Yes. Just about anything you can do to separate your crawl space from frigid exterior conditions is a good idea. But I can’t let you off the hook with such an easy answer. To explain why, let’s remember what happened last winter, when a cold snap extended into southeastern states that don’t usually experience “real” winter. Consecutive days of sub-freezing weather caused pipes to burst in crawl spaces all across the South. Homeowners who never gave a second thought to their crawl spaces suddenly had to deal with major property damage. If your home has a vented crawl space, it probably also has fiberglass batt insulation installed between the joists in the crawl space. So the building’s thermal boundary is the floor assembly. The crawl space itself is outdoor space, complete with insects and rodents who squeeze in through imperfectly screened vent openings. 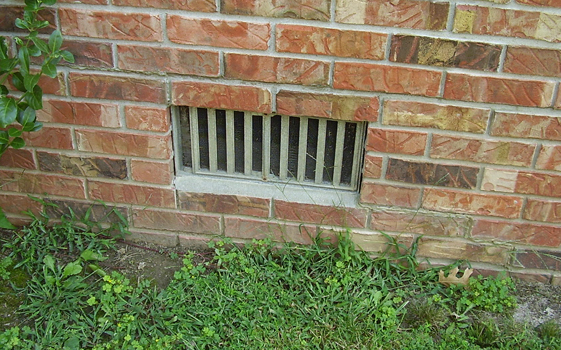 Closing crawl space vents to block the movement of outside air into the crawl space will only provide a small degree of protection from the cold. If you’ve got plumbing lines or air ducts in the crawl space (most crawl spaces do), more protective measures are necessary. Keep reading if you want to avoid burst plumbing lines, icy floors and high heating bills. Wrapping plumbing supply lines with heating cable and installing pipe insulation will provide protection against freezing water lines, but it doesn’t resolve other issues. Here are two options that will make your home more comfortable and less expensive to heat if you live over a crawl space. Having joist bays & the rim joist air-sealed & insulated with 2-part, closed-cell spray foam will provide you with a first-class air and thermal barrier. Option #1: Improve the floor boundary. This option is often recommended for coastal or flood prone properties, where crawl space flooding can occur. The first task is to pull back the existing fiberglass insulation and thoroughly air-seal the rim joist to limit air leaks into the floor assembly. Assuming the fiberglass floor insulation is in good shape, you can then improve this thermal boundary by installing a layer of rigid foam insulation (foil-faced polyiso board is best) below the batts. You would do this by screwing the insulation board to the bottom edges of the crawl space joists. Use compatible tape to seal over joints between foam panels. Water lines will still need freeze protection, and crawl space ductwork should be sealed and insulated. What if your fiberglass floor insulation is in bad shape? Batts that are wet, compressed, missing or serving as a habitat for mice & other pests end up doing more harm than good. Remove the old material, make sure the joist bays are clean & dry, then call in an experienced spray foam contractor. Having joist bays & the rim joist air-sealed & insulated with 2-part, closed-cell spray foam will provide you with a first-class air and thermal barrier. 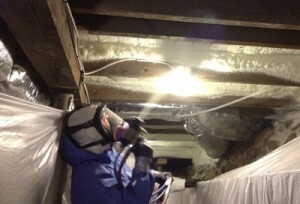 As a bonus, your spray foam contractor can seal & insulate crawl space ductwork for a small additional charge. Option #2: Encapsulate & insulate. This is still the best option if your house isn’t in a flood-prone area. Thoroughly insulate and air-seal the crawl space walls, including the rim joist. 2-in.-thick rigid foam insulation is a good choice for insulating the foundation walls. You’ll also need to cover any vent or door openings with weatherstripped, airtight covers that screw in place. As defense against moisture, dirt, pests and radon gas, install a thick, durable poly moisture barrier over the crawl space floor. To effectively encapsulate the space, you’ll need to lap the poly sheet onto the rigid foam wall insulation and tape the seams fast. Very enlightening subject, also well written and to the point!